Maura E. Scanlon has been with The Scanlon Group Co., L.P.A. since 1988. She represents injury victims in cases involving automobile collisions, insurance disputes, medical negligence, nursing home negligence, and wrongful death. A graduate of the College of the Holy Cross in 1985 with a B.A. in Economics, Maura earned her J.D. from the Case Western Reserve University School of Law in 1988. Maura has been actively involved in various professional organizations. Currently, she is a member of the American Bar Association, the American Association for Justice, the Ohio State Bar Association, the Ohio Women’s Bar Association and the Akron Bar Association. 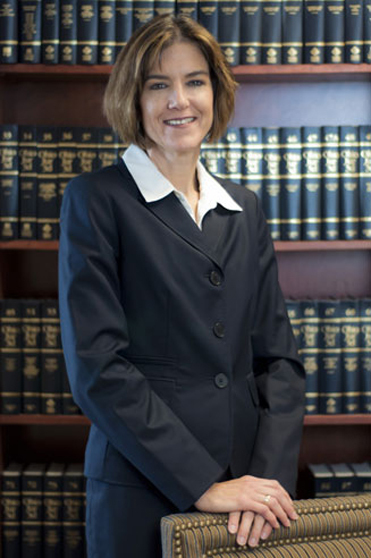 As a member of the Ohio State Bar Association, Maura has served as a representative for District 11 on the Council of Delegates from 2006 to the present, as a member of the Legal Ethics and Professional Conduct Committee from 2011 to the present (Secretary, 2014 – present), as a member of the Women in the Profession Section (2015 – present) and as a Fellow of the Ohio State Bar Association Foundation from 2012 to the present. As a member of the Akron Bar Association, Maura has served on the Board of Trustees (1999 – 2002), as a Fellow of the Akron Bar Association Foundation (2001 – present), as a member of the Judicial Campaign Conduct Committee (2014 – present, Vice Chair 2015), the Finance Committee (2000 – 2001 and 2013 – present), the Investigative Subcommittee of the Grievance Committee (Member 2004 – 2011, Vice-Chair 2007 – 2009, Chair 2009 – 2011), Long-Range Planning Committee (Member 2004 – 2005), Commission on Judicial Candidates (Member 2003 – 2005), the Lawyer Referral Service Committee (Member 1996 – 2002, Vice-Chair 1997 – 1998, Chair 1998 – 2000), the Disaster Response Committee (Member 1991 – 1993), the Communications Committee (Member 1989 -1990). Maura has participated in the Charles Scanlon-Sam Bell Inn of Court (Pupil 1988 -1990, Bencher 2005 – present). Maura has also served occasionally as a guest lecturer at the University of Akron School of Law and has also volunteered with the Law and Leadership Institute’s Moot Court program for high school students through the University of Akron School of Law. Community involvement has always been important to Maura, and she has served on the Board of Directors for North Akron Savings Bank (Member 2004-2014; Member of Audit Committee 2004-2014; Chair of Audit Committee 2008-2014). She is also active on the Board of Directors for Project Grad Akron (Member 2011-present, Chair of Fund Development Committee 2012-present), The Board of Trustees for the children’s theater group known as The Illusion Factory (Member 2006-2012, President of the Board of Trustees 2008-2012), the Finance Council of St. Hilary Parish (Member 2011-present; Chair 2014-present), the School Board of St. Hilary Parish (Member 2008-2011, Vice-Chair 2010-2011), Board of Trustees for the Ohio Ballet (Member 1997-2000, Finance Committee 1998-2000), the Associate Board of Trustees for the American Cancer Society (Member 1995-1998), the School Board for Our Lady of the Elms School (Member 1994-1997), Volunteer Driver for Mobile Meals of Summit County (1989-1994), the Junior League of Akron (Active Member 1988-1998, Sustaining Member 1998-present), Volunteer Coach for Catholic Youth Organization of Summit County (2009-2013) and West Akron Girls’ Softball League (1992-1993). Maura resides in Akron with her husband, James Bozzelli, and their two children.